Grandfathers' Stories Inspire Military Service On Independence Day, we continue an occasional series, Those Who Serve, with a story about an Army captain who grew up hearing about the exploits of his grandfathers in Asia during World War II. Now he's a captain serving in Afghanistan. Capt. 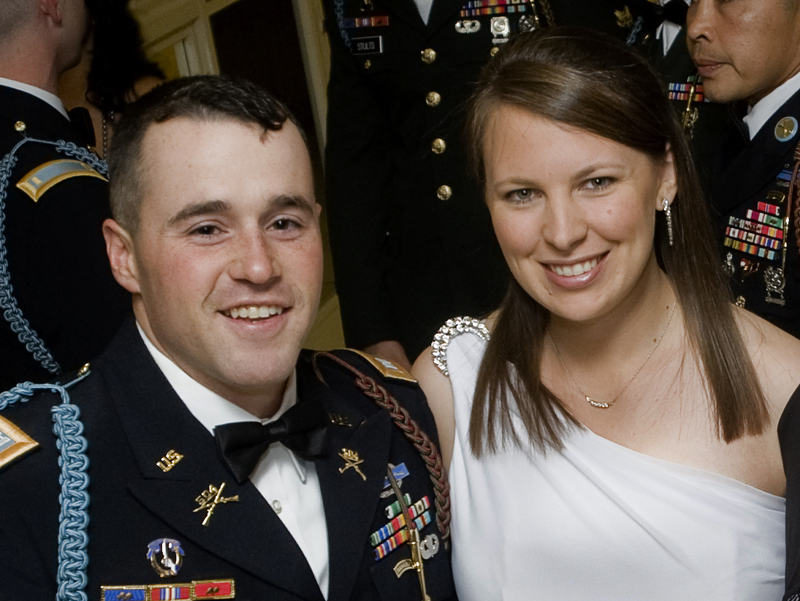 Jared Larpenteur and his wife, Clare, attend a military ball in Fayetteville, N.C., last December. Now, he's serving in eastern Afghanistan. Picture mud walls and grape orchards and wheat fields all the way to the horizon. And in the middle of it all, there's a combat outpost with sandbags, razor wire and a big plywood shack. Inside, there are a few soldiers and officers, all with the Army's 82nd Airborne. One of them is a captain, slouched against the door jam. He's short with a round face, somewhat shy and serious. "I'm an anti-armor company, so I have about 60, 65 personnel in my company," says Larpenteur, referring to the soldiers he commands. His bosses say at 27, Larpenteur is a seasoned combat leader. He's a little more modest. "I consider myself the black sheep of my family," says Larpenteur. "I've got two younger brothers as well, and they've got long hair ... I'm kind of the anomaly of my family." When asked how he ended up in uniform, he replies: "I always knew from an early age. My parents weren't military at all." He says his parents were products of the 1960s and 1970s — they weren't exactly the military type. It was their parents who served in uniform. Larpenteur can recite the places his grandfathers served during World War II. "One actually was a Marine and was on the island-hopping campaign [in Asia]. He fought on Guadalcanal and Peleliu and Iwo Jima with the 1st Marine Division," says Larpenteur. "And my other grandfather was actually a bombardier that flew bombing raids out of the Aleutian Islands along Japan during World War II. I grew up listening to stories from them." It was their stories that began his journey to this soldier's life — an infantry soldier, close to the action. He can't quite explain how it all led to this outpost in Taliban country. "One day in high school it just kind of clicked, and I always knew that this was what I wanted," recalls Larpenteur. "At first my parents were very, very apprehensive." They had reason to worry. It was 2003, the year the Iraq War began. "I basically gave my parents the ultimatum. I told them that, 'Hey, this is what I want to do. I want to join the Army, and I'm 18, and I can do it legally, and I want your blessing, and I'm letting you know if I don't get your blessing I'm still going to join the Army,' " says Larpenteur. "And I think my mom quickly turned to my dad and told him something, and I had their blessing." He had their blessing, with one condition: He had to finish college first. He went to Louisiana State University on an ROTC scholarship. 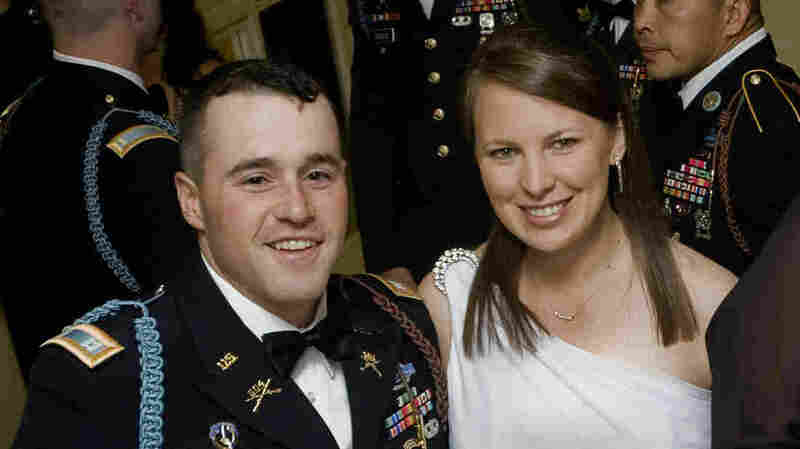 He became a lieutenant, then he went to Ranger School, followed by a tour in Iraq as a platoon leader at a time when the fighting had subsided. There's plenty of fighting in this part of Afghanistan where Larpenteur is currently stationed, a nest of Taliban insurgents. On this particular night at the combat outpost, he's planning a nighttime assault into a village the Taliban control. "There are going to be a couple of specific target houses that we will be going to tonight to clear and investigate," says Larpenteur. Standing in front of a large map at his headquarters, he points to the village where he was betting on meeting the Taliban. "We will take some type of small arms contact. Every time we go into this area we do, and I expect nothing less," says Larpenteur. That's not the way it turned out. His soldiers did not get shot at on that night raid. Still, Larpenteur knows he's responsible for the lives of dozens of soldiers from the 82nd Airborne for three more months. "Our No. 1 worry is protecting our guys and making sure that we all get home safely." Larpenteur has a name for that worry and that responsibility. He calls it "the burden of command." It's a term his grandfathers would have recognized.